Earlier this year America lost a wonderful writer and filmmaker, Nora Ephron. I first encountered Ms. Ephron's writings through her collections of essays, like "Scribble, Scribble" and "Crazy Salad", books passed on to me by girlfriends whose passion for Ephron's humor and worldview became my own. When I subsequently read through "Heartburn", (NY: Alfred A. Knopf, 1983), her semi-autobiographical novel about chef Rachel Samstat, who loses her way during her second husband's adultery, I knew she would always be a part of my pantheon of favorite authors. 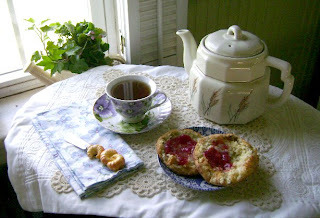 I was delighted when "Heartburn" became the featured selection of Cook the Books, a bimonthly foodie book club that I and three of my good blogger buddies co-host. Simona, of the blog, Briciole, is the host of this round of Cook the Books, and she has enlisted Laura Lippstone, a big Ephron fan and blogger at Planet Lippstone, to serve as guest judge of the posts that we all write featuring our book selection and the foods we cook up inspired by our reading. Dipping back into "Heartburn" was a nostalgic read: there was the nostalgia of seeing that great dust jacket art, the familiarity of sinking back into Ephron's words like having a cozy conversation with a great friend that one hasn't seen in a bunch of years, and nostalgia for the 1980s world that pervades its pages. Ephron describes Samstat's longing for the great produce sections of New York City supermarkets and gourmet shops that she left behind when she moved to Washington D.C. and that made me remember how arugula and twelve different kinds of peppers didn't used to be a common site at the average food store. And then there was that passage that made me laugh out loud when I first read and reread it to my friends back in the early Eighties, and which I read and snorted through and reread to my husband now that we're in the 2000-teens. Toss all of the vegetables in the first part above with garlic, 1/3 cup olive oil, salt and pepper on a cookie sheet. Coat thoroughly with oil and then roast in a 425 degree oven until browned, turning at least once with a spatula. Cook pasta and drain. Toss with roasted vegetables. Mix dressing and pour over pasta and vegetables. Gently toss in scallions, nuts, feta and basil. Serve at room temperature. Serves 6-8. Diane says to try throwing in some cremini mushrooms, yellow and green squash or zucchini, if you want. Simona will be rounding up all the delicious Hearburn blog posts back at the Cook the Books site after today's deadline, so be sure to stop by and see what everyone cooked up. And don't forget to join us in reading, cooking and blogging up our thoughts about "The Hunger Games", by Suzanne Collins, both book and film, for our next round of Cook the Books! It was an impromptu gathering of friends to celebrate the end of summer and a chance to hang outside watching beautiful thoroughbred race horses thunder past us. Our venue was the historic Saratoga Springs Race Track. on Labor Day, the last day of the summer racing season. The racetrack offered free admission for that day, which was a nice bonus. 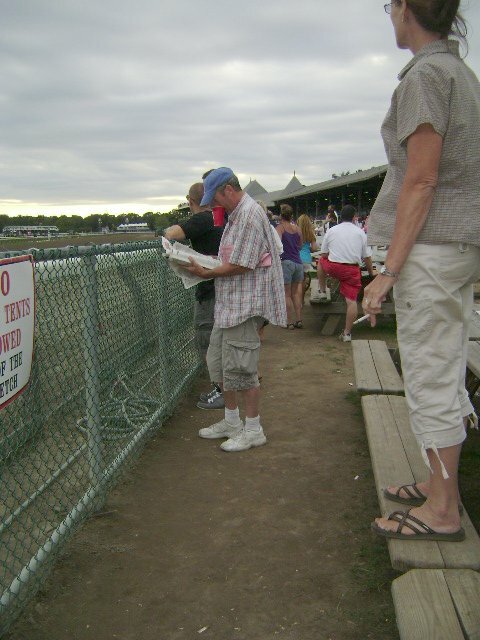 Dan and I went early in the morning to claim a picnic table at The Top of the Stretch (where the horses make their last straightaway sprint to the finish line) by draping our tablecloth on a table near the fence. Next time I will leave the vase of zinnias home, which, though it was kind of a classy addition, invited pesky yellow jackets and wasps to our table. Husband Dan used to go more often in his youth and we were astonished at how many years had passed since we had attended the races. Neither one of us is much of a gambler, but it is always a fun time because the people watching is superb. 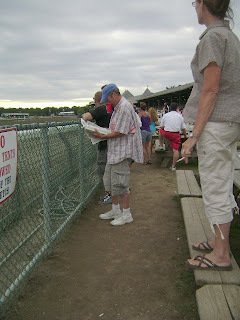 You'll see fashions aplenty from nattily dressed and hatted ladies strolling through the clubhouse to cigar-chomping OTB regulars perusing the racing papers with great intensity. We arrived early and brought our picnic fare and feasted like kings. The weather cooperated with sunshine and not too much humidity, though when the track guys came around in their track misters, we did enjoy the spray of water on our faces turning like sunflowers in the light. Our friends brought a splendid array of delicious foods. We ate some luscious lemony deviled eggs (I'll have my friend Ellen's recipe posted up soon), rice and pasta salads, gazpacho, cheeses, fruit, and other edibles, all packed up in various non-glass containers as per track rules). 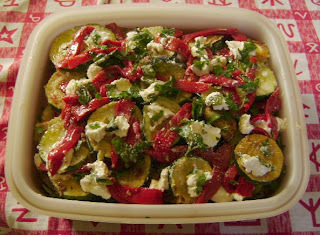 Then there was this luscious cold zucchini salad, inspired by one of Laurie Colwin's essays from her book "Home Cooking". You start with a platter of fried zucchini. I used three largish zucchini, which kept me stationed over a large cast-iron frying pan for a good while the day before. I breaded my zucchini with a mixture of brown rice flour and chickpea flour. 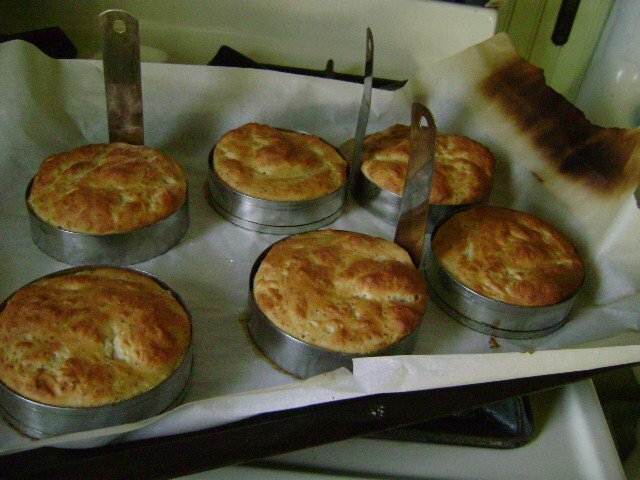 They were moist enough after slicing to not require any eggy painting to make the flour adhere. After I drained and cooled these fried zucchini slices, I layered them with dabs of an 8 oz. log of goat cheese, chopped parsley and basil, and sliced bits of a 12 oz. jar of roasted red peppers. Salt and pepper went between the layers, they got a splash of olive oil and vinegar and that was a wonderful salad that was delicious at room temperature the next day and kept well under the hot temperatures during our al fresco track picnic. Now, to focus more attention on Colwin's delightful book, Home Cooking, which is the featured selection for Cook the Books, the online foodie book club started by me, my buddy Deb of Kahakai Kitchen and my buddy Jo of Food Junkie, Not Junk Food. This book was published in 1988, and has been in my home library since shortly thereafter. Colwin was just a bewitching writer; she was witty, self-deprecating, passionate about the things she loved, and her descriptions of dinner parties (even the ones that went awry) are mouthwatering. My favorite essay is entitled Kitchen Horrors, and I can read and reread this comic chapter and still chuckle out loud. 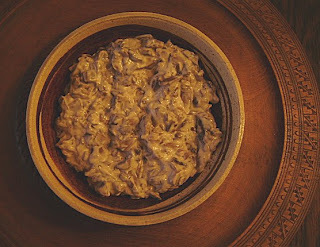 There are so many disasters described in its pages, but none more hilarious than the strange English dessert Colwin attempted to make for an Easter dinner, called Suffolk Pond Pudding. It involved a sugar-encrusted lemon atop some butter and sugar, wrapped in a suet crust and then steamed in a kettle for FOUR HOURS. Well, that's enough description for me, and I certainly wouldn't want to have to ingest it, but Colwin sallied forth and when she produced her dessert, the comments on its appearances included suggestions that it looked like a baked hat and the Alien. The taste produced further editorial commentary: "This tastes like lemon-flavored bacon fat", "I'm sure it's wonderful, I mean, in England", and the straight-forward "This is awful". Ha! Sadly, Colwin died at the tragically young age of 48 from a heart attack (her descriptions of her go-to comfort food, rosti, may have been a complicating factor), so there are not many other Colwin titles to read through, though there is a sequel to this book, More Home Cooking, to look forward to. My zucchini salad was inspired by an essay in Home Cooking, entitled Red Peppers. In it, Colwin describes a favorite dish from an East Side restaurant that she didn't get to often enough. 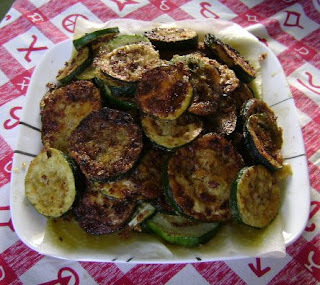 It involved layers of sauteed zucchini slices and pimento strips garnished with olive oil, fresh garlic and lemon juice, which sounds great too. Deb is hosting this current round of Cook the Books, so be sure to check back at our book club website after the September 24th deadline to see Deb's roundup of all the Home Cooking posts. 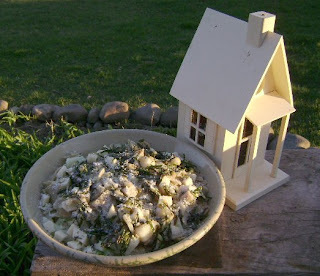 At a recent summer soiree, my friend Laura brought an exotic-tasting salad to the party buffet. It had nubby brown rice, lentils and a blend of mellow, earthy flavors that sent me pestering her for the recipe. The special secret ingredient that knit everything together was a pair of slowly caramelized onions. I made up another batch of this great side dish for my family last week and it was perfect for the sweltering temperatures we've been having. With a simple dressing of balsamic vinegar, spices and herbs, there's no risk of spoilage in the heat, making it a terrific addition for hot weather dining. I didn't have green lentils on hand, just the cute little orange ones that turn to mush when you cook them, so I rooted around my cupboards and came up with a forgotten bag of horse gram, a legume closely related to the lentil, which is a staple in some southern Indian cooking traditions. A lentil will take much less cooking time than the horse gram, which I cooked before adding to my salad, in a pot of boiling salted water for 30 minutes. Melt butter in a frying pan. Add onions, and cook slowly, over low heat, until they are soft, golden and caramelized, about 20-25 minutes. Mix all ingredients together in a serving bowl and season with salt and pepper to taste. Serves 6-8. Double this batch to bring to a party. Serve warm or at room temperature to let flavors mellow. I am sending over a virtual plate of this awesome summer salad to No Croutons Required, a monthly vegetarian recipe challenge alternately hosted by Tinned Tomatoes and Lisa's Kitchen. The challenge this month is for a soup or salad that is suited for hot summer weather, so Laura's recipe is a stellar fit! Recently I was contacted by Westside Market about their recipe for their popular Spinach Quinoa Mediteraneo dish. This New York City market features freshly made prepared foods from recipes by Maria Zoitas, wife of the Market's founder and I jumped right into the kitchen to make this dish. I don't remember to make quinoa often enough, though it's as easy to make as rice (and I even make it in my rice cooker for more simplicity). Quinoa is so delightful in the mouth; the little seed kernels pop as you chew them, sort of like caviar, and the grain itself is one of those nutritional powerhouses, packed with iron, protein and calcium. Here's the recipe for this great side dish, which makes a bit batch, about 10-12 servings, so it's a good choice to bring to a potluck or picnic. This was a delicious dish, but since it made such a big amount and my dill-phobic spawn wouldn't eat it, Dan and I decided to jazzed up the leftovers into an ever more Mondo Mediterraneo cold salad by adding 8 oz. crumbled feta cheese, juice of one lemon and 1/4 cup extra virgin olive oil. Both versions were very good! Thanks to Westside Market for sharing this gluten-free, vegetarian recipe. You can check out more of Maria's recipes at their website. 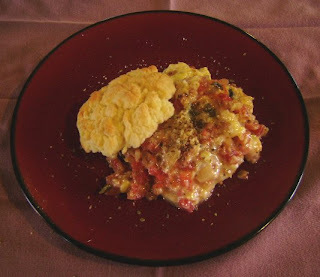 I am sharing this recipe with No Croutons Required, a monthly vegetarian recipe contest held over at Tinned Tomatoes. This month's theme for No Croutons Required is Leafless Salads, so I thought this would be a great entry. Hop on over to Tinned Tomatoes to check out the other entries this month. Bread. The staff of life. The stuff of my celiac husband's dreams. Ironically, while the rest of our non-gluten-free family thinks bread is just okay, Dan must have something bready to complete his dining experience. A plate of pasta is not a whole meal if there is no roll to swab up the last luscious bits of sauce, breakfast isn't right without a couple of slices of toast on the side and breadstuffs are one of the holy trinity of the dinner hour. Blame it on his Irish-Polish ancestry, and while we're at it, we can attribute the celiac gene to the paternal side of his family as well, though they were just known for their "sensitive stomachs" in the days before celiac disease was being diagnosed by the medical community. So he and I bake a lot of gluten-free bread, buns and rolls and keep them, sliced and wrapped in the freezer for quick thawing for his meals. 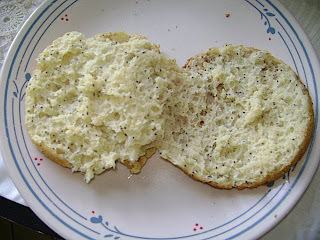 Dan prefers having buns and rolls around to slices of bread, so we've come up with some ways to get the soft, sticky, slidy gluten-free doughs (like using greased metal egg rings that restaurants use when they want eggs to stay in a perfect circle shape on the griddle) to stay in their bun shapes with some success. You can check out more GF bun baking tips at this post from the Crispy Cook archives and then pretty much adapt any gluten-free bread recipe into GF buns. 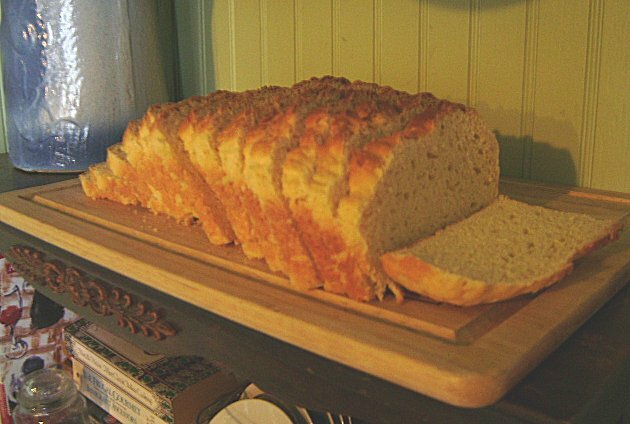 The recipe we use over and over again for sandwiches and for toast is Elizabeth Barbone's Sandwich Bread recipe from her cookbook "Easy Gluten-Free Baking". 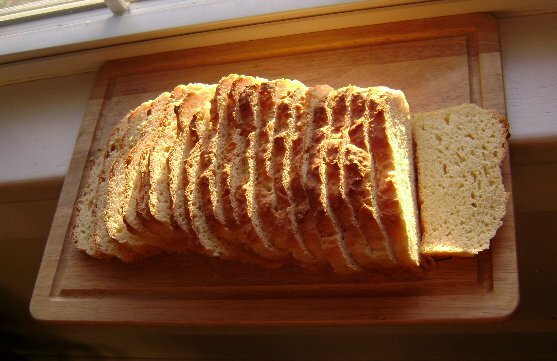 It makes a great basic white bread recipe that toasts beautifully and doesn't crumble easily. With the encouragement of the Gluten Free Ratio Rally bakers, a group of gluten free food bloggers that tackles a different baking project each month and deconstructs/reconstructs them measuring ingredients by weight and recipes by ratios of flour/liquid/fat/egg, I was looking to make a different kind of sandwich bread to add variety to the freezer stash. This month's GF Ratio Rally Host, Karen of the Cooking Gluten-Free blog, picked BREAD as our baking challenge and initially I thought about trying to make a crusty, artisan-style loaf. I just ran out of time and schedule during this busy past month (note dearth of Crispy Cook posts) with various kid, business and garden activities on my plate, so I will hopefully be copying down someone else's recipe for such a gluten-free delight when Karen rounds up all the Ratio Rally posts on June 6th. Mix brown sugar, 4 oz. warm water and yeast together and let stand in a warm, draft-free place to proof for 15 minutes. Meanwhile, mix dry ingredients together in a mixing bowl and whisk until completely blended. The flours are pretty fine, so keep the whisking motion low. And using a deep bowl helps keep the flour cloud down a bit. In another bowl. blend eggs together with remaining water and oil. Add in yeast mixture and blend well. Add to dry ingredients and combine until blended and smooth. Scrape into greased loaf pan. Heat oven to 170 degrees F and then turn off. Place loaf pan inside a clean plastic bag (I use a shopping bag from grocery or store) and loosely tent it. Close oven door and let rise until mostly doubled, about 1 hour. Take loaf pan out, turn oven back on to 375 degrees F and remove plastic bag. Bake 30-35 minutes, or until top is nicely golden-brown. Let cool in pan for several minutes, then carefully tap it out onto a cooling rack and let finish cooling. When completely cool, slice, wrap and stick it in the freezer to use as necessary. Looking forward to seeing what the other creative and talented GF Ratio Rally bakers will be pulling out of their ovens tomorrow! Be sure to check over at Karen's blog to see links to all the other blogger's bread recipes. 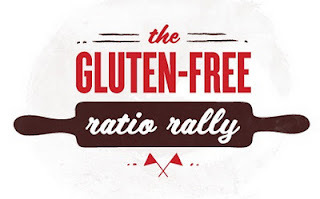 And come back next month to see some gluten-free cracker and breadstick recipes when it's my turn to host the GF Ratio Rally. It's Cook the Books time once again and for this round of the online foodie book club, our host Johanna of Food Junkie, Not Junk Food picked a great book: The United States of Arugula: How We Became a Gourmet Nation, by David Kamp. It's a very funny, well-researched look at how American cuisine came of age in the 20th century and he shares numerous anecdotes, foot notes and social history to show all the players that have influenced the American way of cooking, eating and dining out. Kamp pays particular attention to the troika that are most well known for getting American food out of the canned, processed, instant, Jello-ed doldrums of the post World War II era: Julia Child, Craig Claiborne and James Beard, though there are many gossipy accounts of the minor players that had a hand in it too. I liked Kamp's descriptions of the kitchen hijinks at Chez Panisse, with doyenne Alice Waters lustily ripping through lovers and chefs with great rapidity and the story of Mexican food goddess Diana Kennedy tossing a young, creepily intense Rick Bayless out of her car after he stalked her down in Mexico and pestered her relentlessly with questions when she was having a bit of a crisis during the building of her home. I really enjoyed reading through this book and it has earned a permanent place in my home library, where it will reread and consulted with a great deal of relish, I'm sure. For the Cook the Books club, participants not only read and discuss the book selection, but then we get creative in the kitchen to come up with a dish that is inspired by our reading. I had hopes of picking some arugula from plants that went to seed last year, and picked a bunch to saute with olive oil and garlic and then incorporate in some sort of delicious pasta sauce. Fresh arugula is a wonderful, peppery green, but it is meltingly soft and delicious when cooked, a technique which I first tried in this terrific recipe by Mario Batali for an earlier round of Cook the Books. I went out to the ol' Crispy Garden and picked a mess of arugula leaves. They tasted a little spicy, but they were much, much hairier than the arugula I remembered. I rinsed them off and spun them dry and they were much harder to get clean of dirt specks than the arugula I remembered. All those hairs kept trapping little dirt bits. I looked closer. D'oh! This wasn't arugula. These were volunteers from a red radish plant that went to seed and I let flourish in my autumn 2011 garden, thinking it would attract nice flying pollinators to my garden. Luckily, all was not lost, because I remembered reading somewhere that radish leaves were edible and actually made a good soup. I checked it out with my cookbooks and true enough, radish leaves are edible and so I cooked them up with a bit of garlic and olive oil and they were peppery, if not meltingly soft like the arugula. They had tougher stems and a more forthright peppery taste. Spring tonic and all. This my contribution to this round of Cook the Books. I am delighted that Johanna was able to secure Mr. Kamp himself as our book club judge so you can check back at the CTB website to see the roundup and what our esteemed author thinks about our literary and culinary comments about his work at this link. Looking for a crowd pleasing supper dish that's easy to make and beautiful to bring to the table? Well, I found one, thank heavens, for my finicky family and just in time too. 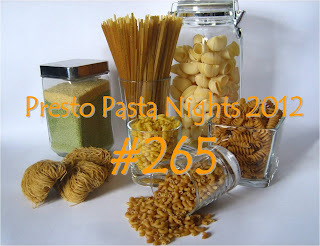 I'm guest hosting Presto Pasta Nights #265 this week and needed some some gorgeous carbs to share with you all. For the uninitiated, Presto Pasta Nights is a weekly celebration of the world of pasta started by Ruth of Once Upon a Feast many moons ago. Each Friday roundup showcases interesting varieties of pasta: macaroni, noodles, spaetzle, pierogies, gnocchi and many glorious other species, prepared in traditional recipes or in intriguing new flavor combinations. You can check back at Presto Pasta Nights to research some of the archives for new recipe ideas or come back here this Friday to see what some great cooks are concocting in their pasta pots. As my regular readers know, this is a gluten-free blog, so wheat-based noodles don't get center stage. However, there are a wealth of other corn, quinoa, rice, buckwheat and other pasta varieties available in today's markets and of course, homemade gluten-free noodles are fun (if messy) to whip up. I used bright yellow corn noodles for my dish, which began with a couple of heads of broccoli, a wedge of smoked gouda and a trip out to the herb garden. One of my family's favorite pasta dishes is a simple bit of steamed chopped broccoli bathed in a garlic butter sauce. It's quick to make for those busy weekday dinners and it suits all of my vegetarians and non-vegetarians, gluten-free and gluten-full eaters alike. I was thinking about that smoked gouda that had been hanging around my fridge, though, and thought that since steamed broccoli with cheese sauce is such a proven winner, pasta with a cheesy broccoli sauce would be a natural pairing. After perusing some of my cookbooks and prowling the Internet, I see that this idea has not only been dreamed up before, it's sort of a standard. Well, it was new to me and my family, and with the addition of fresh spring herbs generously strewn on top, it was gobbled down mighty quick at Chez Crispy. The smoked gouda really lends a rich flavor to this pasta sauce and the delicate onion taste of the snipped chives and chive blossoms just makes everything sing. You could substitute in another kind of cheese, but I think the smoked gouda was the key ingredient here. Cook pasta until al dente. 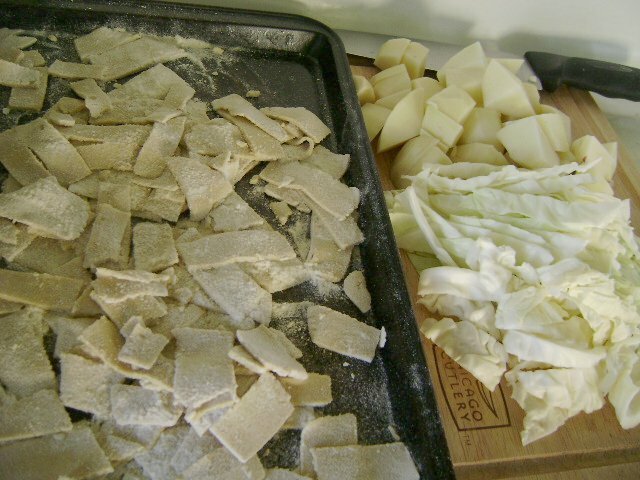 Drain and rinse in hot water to remove starch and keep from sticking. Keep warm. Bring 1 cup salted water to a vigorous boil in another large pot. Add in broccoli and steam until just crisp-tender, about 4-5 minutes. Drain and rinse in cold water to keep green color bright. Set aside. Melt butter in large, heavy-bottomed saucepan. Add rice flour and blend together well. Gradually add in milk, stirring constantly to keep sauce smooth. When sauce starts to bubble and thicken, add in grated cheese and season with salt and pepper to taste. When cheese is all melted and blended in, add cooked broccoli. Dress pasta with broccoli and cheese sauce. 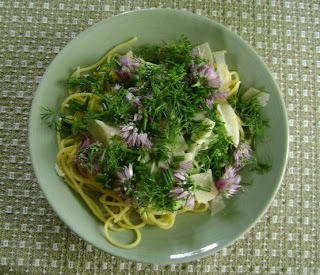 Lay on a blanket of shaved Parmesan cheese, snipped chives and chive blossoms and a wee bit of dill and serve hot. I love when my chive plants are blossoming and will be strewing these lovely lavender blooms on my salads, pastas and stir-fries as long as they keep coming (and the bumble bees allow me in to harvest them). Incidentally, fresh chives are ridiculously easy to put up for eating out of season. Just rinse, pat dry and snip. Pack them into freezer containers or bags and you can just pull them out whenever you need a bit of chlorophyll over the winter. They will be a darker green color and a bit limper when they thaw, but they are very welcome bit of greenery and spring flavor in the heart of winter. I'll be accepting Presto Pasta Night submissions through early Friday morning (May 25), and plan to post the roundup later that afternoon, so please feel free to send me your awesome pasta blog posts until then. I've already received some really tasty entries that I am excited to share with you later. It's a veg-tacular fiesta here at The Crispy Cook this week! 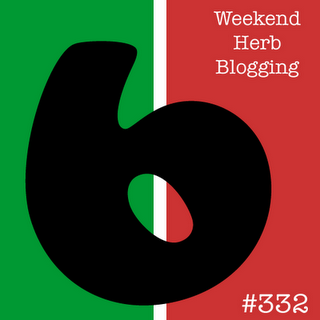 I am delighted to announce that I will be hosting another round of that weekly blog event that is near and dear to my heart: Weekend Herb Blogging. 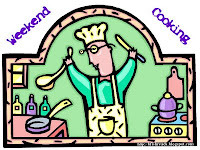 Haalo of Cook Almost Anything is WHB Central for this wonderful event, now in its 6th year of operation. Each week, great cooks and gardeners from around the world share recipes and tips for foraging or growing all kinds of delicious vegetables, herbs, flowers, fruits and seeds. If it's a member of the Vegetable Kingdom, it's likely been featured in an edition of Weekend Herb Blogging, although I always seem to find a new ingredient or way to cook an old favorite in a novel way with each round of WHB. If you have an interesting WHB post, please send it on to me by the deadline of Sunday, May 6th and I'll include it in my roundup the next day. 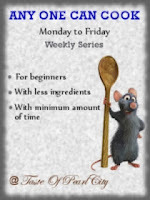 For more information about Weekend Herb Blogging rules, see Haalo's website here. Things are still quiet in my home garden, except for some chives about to pop, so I thought I would highlight the bountiful crop of hot peppers from the 2011 Crispy Garden for my WHB post. I grew another batch of Tiburon peppers, a fairly spicy dark green poblano. We roasted them, we made chili rellenos and casseroles, put them in salsas and other sauces and chopped up so many that our entire chest freezer is perfumed with their scent. I also planted a flat of Gypsy peppers from our nearby farm market, which I thought were supposed to be somewhat mild, but they tasted pretty darn hot to me and my crew. My Zone 4 growing season is not quite long enough to get this pepper variety to turn that glorious orange (this is a photo from the night-before-frost, when I had a kitchen full of buckets o' veggies) but I did get at least one orange Gypsy pepper out of the bunch. These Gypsy peppers were good frying peppers, but again, they were on the pungent side, so we mostly chopped them up for the freezer last harvest season and have been since adding them judiciously to our suppers. With such a bounty of hot peppers, we also tried our hand at making a hot pepper and garlic paste, like a Thai green curry paste, to freeze and this proved to be a wonderful little condiment. 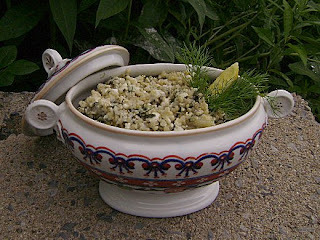 I just added seeded and rough chopped Tiburon and Gypsy peppers to my hard-working blender, and then added in a handful of peeled fresh garlic and maybe a couple of tablespoons of olive oil and pulverized the whole thing until it was a light green, creamy consistency. A little salt and pepper and then I froze this hot pepper paste in 1/2 cup containers (as a little goes a long way!). It's a little watery when you thaw it, but you can drain it a bit before adding it to other ingredients. In addition to using this hot pepper condiment as a green curry base, I've found some other great uses for it. I've mixed it with sour cream for quick dip or taco side sauce (fantastic with fish tacos!). We scarfed down a batch of fettuccine slathered with some of this pepper paste mixed in with ricotta cheese and herbs and I have plans for it for my annual gazpacho frenzy, when the tomatoes are starting to come in but the peppers are still lagging behind. If anyone has any other great ideas for this hot pepper goodness, please let me know. Looking forward to receiving your Weekend Herb Blogging posts! I've already gotten some deliciousness in the email basket that will delight you. ***I also wanted to announce the winner of the giveaway copy of Denise Jardine's Dairy-Free and Gluten-Free Kitchen cookbook. The winner is commenter number 12, Betsy. Congratulations Betsy! And thank you to Ten Speed Press for furnishing the giveaway copy of this cookbook. Rink Tum Tiddy, an alliterative name that sounds straight out of a Rudyard Kipling or A.A. Milne poem, is the subject of today's post. I've been curious about this eggy saute since I was the volunteer typist for a fundraiser cookbook "Country Cooking" (1990, Saratoga County Affordable Housing Coalition) and received this interesting sounding recipe from a Gretchen Z. at Legal Aid. Also spelled Ring Tum Diddy, Rum Tum Tiddy, and variations in between, this dish is a kissing cousin of Welsh Rarebit and I found recipes in several vintage cookbooks. "Rum Tum Tiddy" is an entry in the 1965 edition of the Fannie Farmer Cookbook, in which it is described as "especially good for the teen-age crowd", and consisted solely of tomato soup mixed with melted cheese and a little seasoning. A 1945 edition of the same cookbook has the same recipe, only a beaten egg is mixed in at the last minute. In a 1973 edition of the Joy of Cooking I found a recipe for Tomato Rarebit, also known as Woodchuck (more silly names! ), which called for a concoction of tomato soup, onions, cheese and separately beaten egg yolks and whites served over toast or crackers. Older cookbooks I consulted did not have recipes for anything tomatoey, eggy and cheesy, so I suspect this may have been one of those Depression Era comfort foods that arose and fell during the mid to late 20th century. I like the heartier version of Rink Tum Tiddy Gretchen provided as it's got a bit more texture and vegetable heft. It's a quick recipe and a tasty, if slightly messy, one too. It certainly was an inexpensive brunch for us this past week, piled onto one of Dan's tender Buttermilk Biscuits. It reminded me of an inside-out Western Omelet, and could certainly be changed with different seasonings and vegetable ingredients to suit a variety of tastes. Melt butter in a heavy skillet. Add peppers and onions and cook until softened, about 7-10 minutes. Add tomatoes and cook, stirring occasionally, another 5 minutes. Add in cheese and let melt. Pour eggs over all and cook over low heat, letting eggs set on top and gently prodding around the edges with a thin spatula to keep bottom from browning too much. Serve hot over a toasted biscuit or bread. The juiciness of the Rink Tum Tiddy will soften the underlying bread quite nicely. Makes two very hearty supper/brunch servings or 4 smaller breakfast portions. 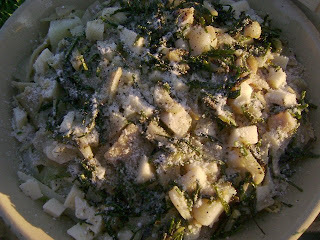 I imagine one could add more veggies, (celery, cooked potato cubes, more eggs and cheese) to feed an even larger crew. It is time to Cook the Books once again with the best darn tootin' online foodie book club, and this time round we are reading that childhood classic, Charlie and the Chocolate Factory by Roald Dahl. 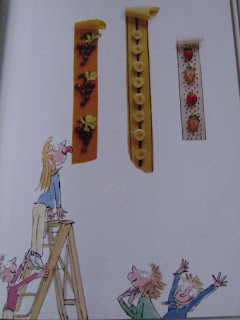 I have seen a couple of different illustrated versions of this book but I think Quentin Blake's artwork invokes the playful spirit of Dahl's words just right. I zipped through all of Dahl's juvenile novels as a youngster and freshly enjoying reading them aloud to my daughters when they were small. We all especially loved The Twits, his book about a thoroughly obnoxious, smelly man and wife who get their comeuppance from the children, monkeys and birds they torment. 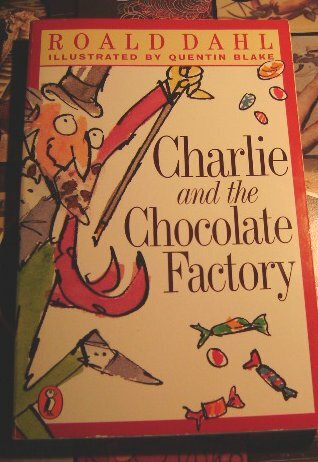 It was a pleasure to dip in again with little Charlie Bucket and his sprightly Grandpa Joe as they explore the wonders of Willy Wonka's amazing Chocolate Factory with a bunch of rotten kids and their equally revolting parents. The kids represent several vices: Augustus Gloop is a glutton, Mike Teavee embodies rudeness and lack of imagination (he watches TV all day long), Veruca Salt is the eptitome of the spoiled brat (and veruca means wart, I just found out, ha!) and Violet Beauregarde is pushy. 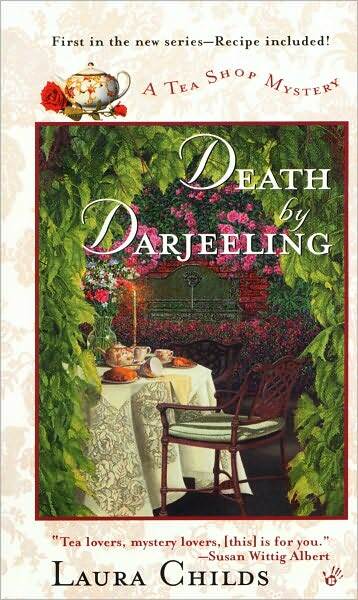 I would recommend this witty book to anyone looking for a wacky, slightly sardonic romp, old and young alike. "Lovely stuff, lickable wallpaper!" cried Mr. Wonka, rushing past. "It has pictures of fruits on it - bananas, apples, oranges, grapes, pineapples, strawberries, and snozzberries..."
"Don't interrupt!" said Mr. Wonka. "The wallpaper has pictures of all these fruits printed on it, and when you lick the picture of a banana, it tastes of banana. When you lick a strawberry, it tastes of strawberry. And when you lick a snozzberry, it tastes just exactly like a snozzberry..."
"But what does a snozzberry taste like?" I'm not sure what I think a snozzberry would taste like. I keep seeing an extra "h" in there and thinking "schnozz-berry" and that conjures up awful suggestions of nose boogers. So I wasn't going to go the snozzberry route. However, I also possess another wonderful book, Roald Dahl's Revolting Recipes (by Felicity Dahl and Josie Fison), which is a cookbook that brings to life many of the wild foods discussed in Dahl's oeuvre (with the bonus of featuring Quentin Blake as illustrator again). There is a beautiful rendition of lickable wallpaper there made with an apple-gelatin puree, which, after being rolled out and dried, is like a sticky sort of fruit leather that can be decorated with various fruits and edible garnishes. Continuing on with my exploration of lickable wallpaper, I found a web link to a BBC show featuring chef Heston Blumenthal and his creation of a Chocolate Factory Feast in which celebrity guests got to lick up some tomato soup and prawn cocktail flavored wallpaper. That was getting more interesting to me, though I do have some hygienic concerns. First, unless you tear off the sheets of this lickable wallpaper or have some sort of crazy conveyor belt to keep fresh spots of wallpaper available for new lickers, there will be sodden, bacteria-laden patches that someone else may inadvertently plant their lips on. I just keep thinking of petri dishes or flypaper. Then I thought about licking wallpaper and then tearing off a strip to eat. I thought about those homemade flyers that have strips at the bottom with people's phone numbers to rip off, and then that got me thinking about making edible wallpaper using nori, those sheets of roasted seaweed that one uses to roll sushi. With some inspiration from these Internet recipes: here and here, I set off to experiment with some toasted nori as my lickable wallpaper base. 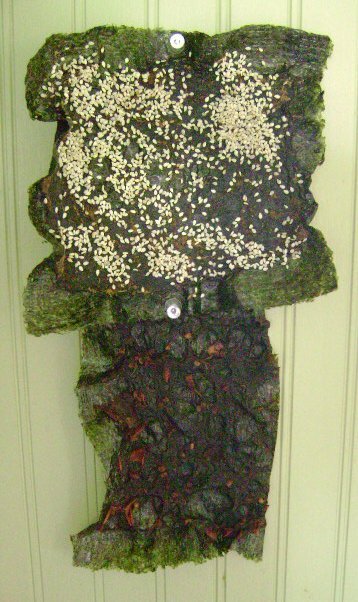 Nori is certainly handsome enough to hang as edible wallpaper on its own, but I thought about painting it with all sorts of condiments from the inexhaustible supply that festoons my larder and fridge and then toasting it to a crackling, CRISPY-edged goodness. I get these bags of Japanese seaweed snacks at Albany's Asian markets and they are so addictive. They come in Tom Yum, Tomato, Wasabi, Spicy Squid and Plain Salt flavors and I am hooked. First, I preheated my oven to 250 degrees F. Then I painted, drizzled or sprinkled on my nori wallpaper adornments and baked each batch for ten minutes. Experiment One: I mixed a little Thai green curry paste with soy sauce and painted that on two pieces of nori. One also got a sprinkle of sesame seeds. 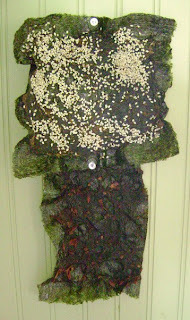 Result: Too salty, though I was pleased to see that the sesame seeds adhered to the nori after baking. Experiment Two: I beat up an egg white and brushed it on two pieces of nori. One was sprinkled with Five-Spice Powder and the other was dusted with Smoked Paprika. Verdict: Good adhesion of spices, both flavors good. Experiment Three: Some leftover pesto spread on one sheet of nori. Some chili-garlic-black bean paste spread on the other. Verdict: Both tasted good, but they result in soggy nori centers. Experiment Four: Drops of liquid smoke on one sheet of nori and splash of hot pepper sauce on another. Both spritzed with Dr. Bragg's Liquid Aminos (it's like soy sauce in a spray bottle, very handy). Verdict: Liquid Smoke nori is inedible. Hot pepper sauce version okay. Experiment Five: Two sheets of nori brushed with egg white and sprinkled with sesame seeds. Quick shot of Dr. Bragg's to serve as fixative. Verdict: Best tasting and looking version. Not too salty, but pleasantly so. Ultimately, this experiment with lickable, edible wallpaper proved that the simplest adornments proved the best. 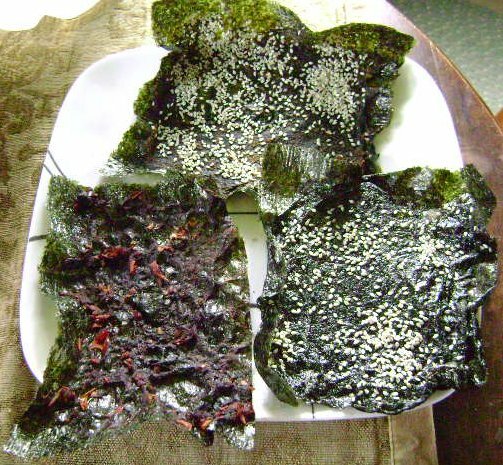 Just a simple spritz of Dr. Bragg's or a painting of beaten egg white and a sprinkling of sesame seeds made the CRISPIEST, tastiest toasted nori snacks, though for visual beauty, I must say I fancy the nori with chili, garlic, and black bean paste. And while I thought about making my family line up to the kitchen wall to chomp off a portion of these nori snacks, I ended up snipping them into strips with kitchen shears and offering them up a bit more elegantly. Though I sped through a full ten-sheet pack of nori, this would be a splendid way to use up leftover nori sheets after a bout of sushi-making. Our Cook the Books hostess for this round, Deb of Kahakai Kitchen, will be back after the March 26 deadline to post a roundup of all the great dishes. 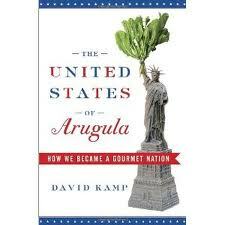 You still have time to join in the fun, or you could wait until the next round of Cook the Books when we will be reading "The United States of Arugula" by David Kamp. One of life's simple truths is that it is a magical thing to memorize a few words in another language before venturing out into new territory. Knowing how to say hello, thank you, yes, no and please really seems to be a passport into people's hearts. That simple act of cramming a little foreign lingo (aided by some hammy pantomiming) brings a lot of smiles and assistance in my experience. This truism worked its usual charm when I recently shopped at a wonderful Ukrainian deli and market in Albany, Dnipro. Armed with my meager yet potent arsenal of Russian stock phrases, and accompanied by my friend Lisa, we sallied forth for exotic provisions for a party that night. Shopping at Dnipro was so much fun. There is a large selection of cookies, teas, canned goods, spices, and other foods from Croatia, Israel, Poland, Ukraine, Russia, and other Eastern European countries and just scanning the colorful packaging and Cyrillic lettering is a graphic design treat. Most all packages I saw had ingredients lists in English, which is essential when shopping gluten-free and overall, I thought the prices were quite modest. There's a refrigerator case in the back of the shop where customers were purchasing slices of luscious, cream-laden cakes and a dairy case full of interesting kefirs and cheeses. Lisa and I were lured into line by the deli counter, though. We both share a love for pickled fishes and vegetables and a taste for gustatory adventure so we were quite literally drooling by the time we were at the head of the line. We were there on a Saturday afternoon, when the store was quite crowded, so we were mindful that we didn't want to hold things up when we began ordering. After mumbling the magic phrase, "zdravstvujjte" (which means hello, pronounced along the lines of zuh-razz-wheats-yuh), the lovely blonde woman behind the counter started offering sample after sample to us both, prodded on by the customers behind us who also directed her to give us slices of their favorite deli meats. We were the only ones who seemed to be trying to hurry things along, and it was very gracious of both the staff and customers to stuff us like the sausages behind the glass. It was also certainly fortuitous that I remembered how to say good (haroshaw) and very good in Russian (aw-chin haroshaw) in those interludes when our mouths weren't busy chewing. We left with a whole bag full of delicious things, from Polish cookies to spicy carrot salad, but what really captivated me was a simple tub of creamy mushroom salad. I hope to return soon to see if the Dnipro folks will part with this awesome recipe, but in the interim, I had such a hankering for it that tried to recreate it in the Crispy Cook test kitchen. The salad had small cubes of mushrooms in what I believe was a mayonnaise dressing, with a delicate hint of onion. I really didn't detect any other clues about other ingredients, and am intrigued that such a simple combination of items could produce such a delectable treat. I did a little research in my raft of cookbooks and at the public library, but couldn't find a recipe for a traditional Russian Mushroom Salad made in this style. There were recipes for pickled mushrooms, mushrooms with potatoes and cucumbers, raw mushrooms tossed with lemony vinaigrette, mushrooms and tomatoes and so on, but nothing quite like what I had purchased. I experimented in the kitchen and came up with this very nice recreation of the earthy, yet delicate-tasting Dnipro salad, though it wasn't exactly the same. I shall have to return soon for another container of this mycological manna, but in the interim, this version makes an excellent treat for the table, slathered on some sturdy bread or eaten plain as a side dish. Heat butter in a pan and add in garlic and onions. Cook, stirring occasionally, until they are translucent about 4-5 minutes. Add mushrooms and sprinkle with a little salt to encourage the 'shrooms to release their juices. Cook another 10-12 minutes, stirring, until the mushroom juices are most gone. These cooked mushrooms will have absorbed all the seasonings and juices from the pan. Let cool for 5 minutes. 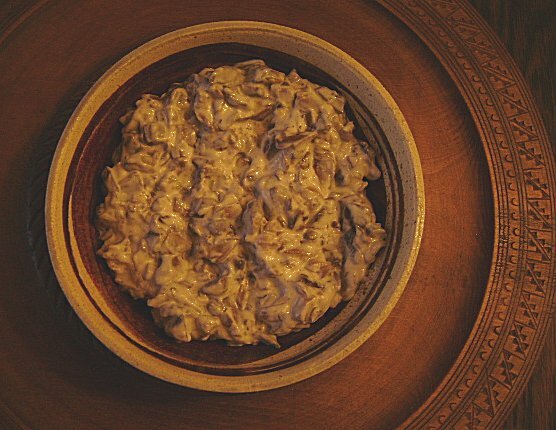 Season with salt and pepper and fold in mayonnaise and sour cream. Chill before serving. I resisted the urge to zip this mushroom salad up with chopped parsley, dill or chives, because I was trying to recreate that particular salad, but I would think these would be great additions. There's a great local blog review about Dnipro at All Over Albany, where you can find driving directions, read more about the array of smoked meats, and see photos of the front and back (the entrance is in the back) of the store's grey modernist architecture. (I'd like to think the building was appropriately Soviet Style ugly, but visit the SUNY Albany campus or Empire State Plaza and you'll see the same dreary design vibe, so it's more that it's just Rockefeller-esque). Aesthetics aside, just remember your spasibas and you'll be in like Flynn, or rather, Fyodor. I'm sharing this recipe with Weekend Herb Blogging, a weekly blog event headquartered at Cook (Almost) Anything and hosted this week there as well. **Don't forget that I currently have a copy of Elizabeth Barbone's newest cookbook "How to Cook Gluten-Free: 150 Recipes That Really Work" to offer as a giveaway until March 21st at midnight. To enter the giveaway, leave a comment after this recent post. 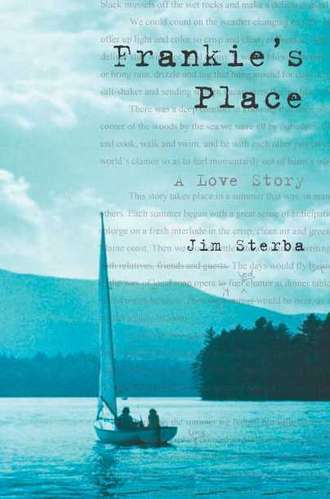 Reading Frankie's Place: A Love Story, by Jim Sterba (NY: Grove Press, 2003) makes you feel like you are visiting friends at their summer camp on Maine's Mount Desert island. Sterba's book is an atmospheric account of his courtship of, marriage to and many felicitous summers spent with fellow author Frances "Frankie" FitzGerald. Sterba is a former NY Times and Wall Street Journal foreign correspondent and FitzGerald is a Pulitzer Prize winning nonfiction writer, both of whom found love later in their busy, globe-hopping lives. The book revolves around the slower pace of summers spent at Frankie's place, a family-and mosquito-shared cabin in the woods near the shore. It might be summer, but there is still a schedule to adhere to: Frankie is an advocate of morning dips in Maine's icy waters, calisthenics and excessively long hikes, which Sterba loving refers to as FitzGerald Survival School. There is also much writing to be done (Frankie likes a manual typewriter for that task), reading, sailing, mushroom hunting, mussel gathering and other foraging/shopping for provisions. There's also an amusing chapter about the author's search for WASPs (White Anglo-Saxon Protestants) on this island historically populated with many of these folks. He researches the subject at the library, at a private swimming club, and in other prowlings around the village of Northeast Harbor. They elude him, particularly the wily subspecies, the High WASP, until a chat with a friend clues him in to the fact that he married one. Oh. Punctuating all the prose is Sterba's recipes - offered in somewhat slapdash prose style, with plenty of room for variations according to what the pair might have rustled up from the ocean, container garden or woods. I have festooned my copy of the book with lots of bookmarks to hold my place for various recipes, but one dish called out to me immediately. 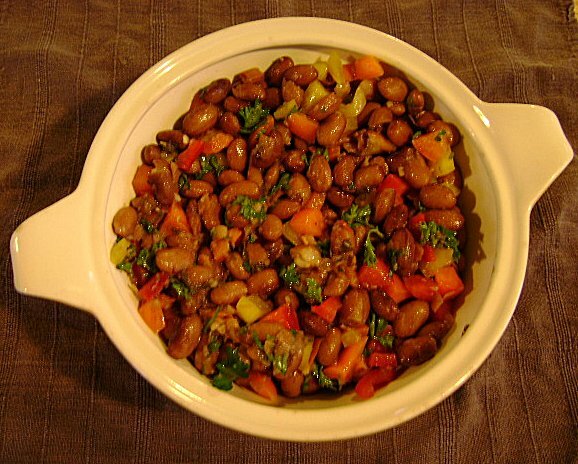 Sterba describes a warm bean salad that he first tried at a friend's wedding. He pestered the caterer like a good newspaperman until she gave up her secrets and so I offer to you my own adapted version that made us all very full and happy at Chez Crispy Cook. The night before, cover beans with cold water and let sit out at room temperature to soak overnight. Change water 2-3 times. The next day, drain beans and place in a large, heavy soup pot with 2 Tbsp. olive oil, onion, garlic, bay leaves and vegetable broth. I added in the soup trimmings as noted above to further enrich my bean broth. Bring to a boil and then simmer along merrily until beans are to desired softness (about 1-1/2 hours). Drain off and reserve bean broth. 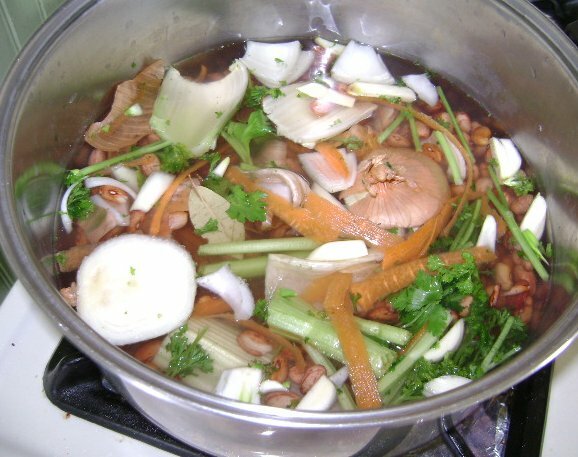 Let beans cool a bit, and then fish out all the large bits of veggie detritus (onion skins, celery stubs, parsley stems, bay leaves, carrot peels, herb branches). The garlic should have become quite soft so you can just "moosh" that in, to use a favorite Sterba cooking term. Mix up a vinaigrette with 1/4 cup olive oil, lemon juice, fresh herbs, and peppers. Add in some of the reserved bean broth (about 1/2 cup). Let stand for 20 minutes, stirring occasionally. Gently dress the beans and season with salt and pepper to taste. Vanessa's Beans are some good frugal eating and I even have leftover bean broth to use in other recipes (I'm thinking about some pasta fazool later on). I have sampled and made many other bean salads, but I think the key here is that the beans are warm and infused with so many aromatic flavorings in their cooking liquid that they really melt in your mouth. One serving of this lovely dish is being sent over to my friend Simona at Briciole for her semi-annual Novel Food event, where you will find lots of other interesting posts about various books and the recipes inspired by them after her March 18 deadline. A second serving of Vanessa's Beans is being sent to another blogger compadre, Heather of Girlichef, who is guest hosting My Legume Love Affair #45. This monthly blog event celebrates legumes in all their glory and is the brainchild of Susan the Well Seasoned Cook.